Inner O-Ring Diameter: 2.887 in. O-Ring Cross Section: 0.139 in. Outer O-Ring Diameter: 3.387 in. Facilitate quick oil warm-up. Billet aluminum sandwich style. Made for most typical applications. Earl's Performance Products was founded by Earl Fouts in 1955 in Lawndale, California. Starting out as a small Army Navy Hardware Surplus Store serving the hot rod and racing communities of Southern California. The mission was to supply high-quality military aircraft specification surplus plumbing components directly to the racing industry from a small retail outlet. As the military surplus market dried up, Earl recognized the need for continuity of supply to the racing market and pioneered the Earl's range of hoses and fittings that are still used (and copied) today. In doing so he created the racing aftermarket A.N. plumbing industry. 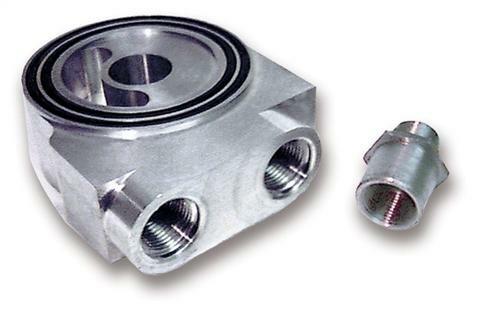 Earl's developed and patented the self-indexing adjustable hose end in 1973, known as the "Swivel Seal". It allows 360 degree adjustment after installation making plumbing a snap. Earl's has invented most of the special purpose racing adapters, and was the first to introduce flexible Stainless Steel PTFE lined hoses to the racing industry in the 1960s long before today's modern fuels forced many hose companies into obsoleting their hoses in search of a better solution. Earl's racing heritage is second to none and is also the most replicated but never duplicated A.N. plumbing in the world. All of today's plumbing companies continue to follow Earls lead and steal from its engineering designs. Often replicated but never duplicated Earl's continues to innovate plumbing for all segments of motorsports and car builders worldwide. Earls is sold across the globe and Earl's has the most complete line of performance plumbing on the market. Manufacturing is headquartered in Bowling Green, KY and has four secondary distribution locations in Indianapolis on Gasoline Alley, Earl's UK at the track at Silverstone, Earl's Australia located in Sydney, and Earls Store 1 in Lawndale California. Earl's Racing Products will continue its leadership role as the best engineered and best quality plumbing products on the market.